This is my very first giveaway. What's the hottest toy this year? You probably already know every toddler and elementary aged kiddo can work a smart phone, computer and Ipod better than you. The hottest toy, there very own tablet. 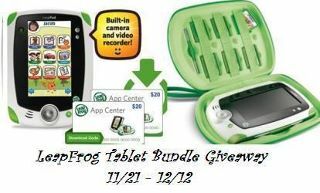 ATD and 16 other bloggers have come together to give one of our lucky followers there very own Leapfrog Tablet, carrying case and $40 app card. The perfect gift for any kiddo. All you have to do is complete the tasks below on the rafflecopter form. Allow Rafflecopter a chance to load below. Hurry and enter here to win your dream bed end 7/7/2011 at 11.50 pm Good luck everyone. I am a big fan of Margaritas in any form but my fave is frozen margaritas. I love Anything with strawberries. So my fave recipe for margaritas is Ultimate Frozen Strawberry Margarita. OMG I love this recipe I found it online a While ago. Bake smarter with Nutrition First™, a complete line of easy to use bake mixes designed with your better health in mind. Packed with benefits, including at least 20% of the recommended daily fiber intake per 57g serving. I love Pork any in form from bacon to ribs . Head over to Eighty MPH Mom where you can win a Pork Prize Pack ($150 ARV)!